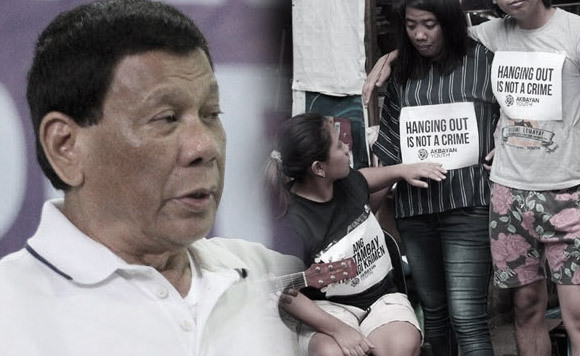 Home / News / Politics / Duterte to anti-tambay law critics: "Nagpapansin lang"
Duterte to anti-tambay law critics: "Nagpapansin lang"
President Rodrigo Duterte has a response to all the citizens who have criticized his new order of police crackdown on "tambays" or street loiterers, saying that these people only want media coverage. “Wala namang inaaresto. I just don’t want you using the streets to loiter kasi ako noong mayor pa, nagda-drive ako ng taxi. Ito mga dada na ito, na wala ‘yang… Pa-ano lang… Nagpapansin,” he said during the distribution of Certificates of Land Ownership Award (CLOA) in Cabatuan, Iloilo. Duterte was in Iloilo on Wednesday and gave his speech. He added that the policy is only to make sure that the streets are organized, and shrugged of accusations that the order was anti-poor. The President, who was once Davao City Mayor advised the people to look at Davao City as an example of the success of such ordinance. He emphasized that his concern is the safety of every citizen in the streets. “Look at Davao. Kung masunod ko lang ‘yung Davao sa lahat, okay na. Komportable na tayo,” he said. “That’s the kind of life that I want every Filipino to — you can walk around, park o rural road. Hindi ‘yung para sa kriminal p****** i** kayo. Huwag kayong magpakita diyan kasi kayo ang walang katwiran na magpasyal-pasyal kasi ‘pag makita kita, madampot pa kita,” he added. The drive against tambays was intensified sine June 13, when the president ordered the Philippine National Police to go after the loiterers. According to National Capital Region Police Office chief Supt. Guillermo Eleazar, around 5,500 "tambays" have been apprehended. As a defense, PNP chief Director General Oscar Albayalde said the “tambays” were not arrested for simply loitering, but for violating local ordinances such as smoking in public and going around half-naked. Meanwhile,netizens have deemed the ordinance as "anti-poor", defending these "loiterers" claiming that these are people who are deprived of education, or do not have decent homes, nor money to pay for places to spend time in. More netizens said that there should more focus on providing better opportunities for these citizens such as education and housing, instead of rounding them up.